When life feels out of control, bake some bread. One of the top items on my culinary Bucket List has been “bake bread.” And by that, I mean real yeast bread, without the use of a bread machine. 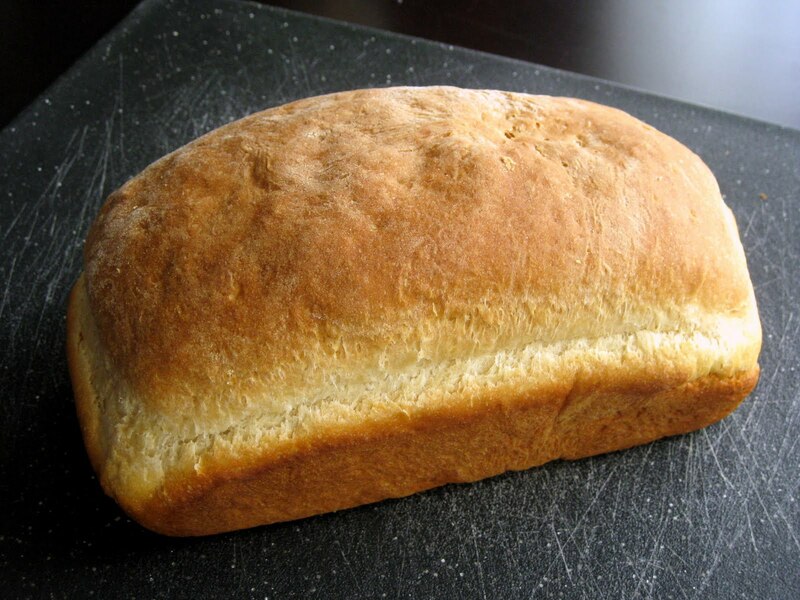 Just the thought of baking bread, with all the kneading and rising business, intimidated the cooking pants off me. Bread needs meticulously measured ingredients and just the right conditions. I figured my efforts at baking bread would most likely result in me crying against a kitchen stool, with a tough brick of dough in hand. One recent day, feeling particularly anxious and out of sorts about my life, I decided to go for it. Armed with basic ingredients and an oven, I braved the bread-making world. I mixed, and kneaded, and waited. That’s the difficult about bread…the waiting. You need to wait while the dough rests and rises, trusting that the yeast will magically do its work. But the reward was worth the exercise in patience. Hours later, I pulled two beautifully browned loaves out of the toasty oven. As I had my first taste of the freshly baked bread, my frustrations and weariness melted away in a moment. After all, life can’t be all that bad when you can make bread. In a large mixing bowl, combine 2 1/2 cups of the flour and the yeast; set aside. In a medium saucepan heat and stir milk, sugar, butter, and salt just until warm (120-130 degrees) and butter almost melts. Add milk mixture to flour mixture. Beat with an electric mixer on low to medium speed for 30 seconds, scraping sides of bowl constantly. Beat on high speed for 3 minutes. Using a wooden spoon, stir in as much of the remaining flour as you can. Turn dough out onto a lightly floured surface. Knead in enough of the remaining dough to make a moderately stiff dough that is smooth and elastic (6 to 8 minutes total). Shape dough into a ball. Place in a lightly greased bowl, turning once to grease surface of dough. Cover; let rise in a warm place (such as upper rack of a cool oven with a bowl of warm water placed below it on the lower rack) until double in size. Punch dough down. Turn dough out onto a lightly floured surface; divide in half. Cover; let rest 10 minutes. Meanwhile, lightly grease two 8x4x2-inch loaf pans. Shape dough halves into loaves by patting, tucking edges underneath. Place shaped dough halves in prepared pans. Cover and let rise in a warm place until nearly double in size. Bake in a 375 degree oven about 40 minutes. Cover loosely with foil for the last 10 minutes to prevent over-browning. Immediately remove bread from pans, and cool on wire racks. Can I Hibernate From This Week? I've always wanted to bake bread. Looks yummy! I'm afraid to bake bread for that same reason! You give me a little more confidence. Thanks for sharing. This looks really good.Like Sizzle, I've also always wanted to bake bread.